There is nothing more fun than hosting a summertime backyard bash. The summer is a great time to get together with friends, throw some grub on the grill, swim, and kick back to enjoy good rays and good days. Of course, no party would be complete without plastic red cups. Since you’ll already be purchasing quite a few disposable cups, why not pick up a few extras for decorative lighting? Here’s your step by step guide to creating your very own red cup glow. 2 strings of Christmas lights . Choose clear, white, or colored depending on the look you are trying to create for your party. If you’re going for more illumination, we suggest using clear or white lights, as they will shine brighter through the red colored cups than multi-colored or colored Christmas lights. To begin, decide whether you want to use the regular 16 oz. cups or 2 oz. mini cups. We recommend using the 16 oz. cups. Using smaller cups will likely not completely cover the small bulbs, while using the larger cups will. Purchase at least 1 pack of cups. They are usually sold with 50 in each pack. 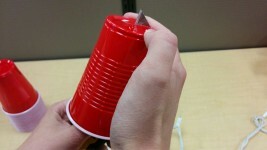 Using your pairing or exacto knife cut slits in the bottom of the cups. Once slits have been added, place cups on each individual bulb and base. Simply plug them in, or if they’re battery operated, power them on. Voilà, let there be light! Feel free to use your strings of lights indoors or outdoors. Use them to add a little extra pizzazz to the patio. 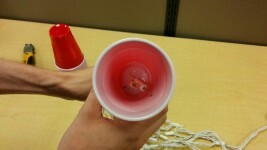 Hang strings vertically to create a fun and festive SOLO cup light curtain and let the summer fun ensue. How do you plan on decorating your summer bashes with lights? Let us know in the comments section below, and as always drop us a line on Facebook, Twitter, GooglePlus, Pinterest or Instagram!